In 1913, a man calling himself Roger Bacon kills a French priest, whose daughter, Alice Elliot, flees to Asia to escape her father's murderer. However, Bacon still pursues her, finding a train in Asia transporting her to safety, where a man named Yuri Hyuga, guided by a mysterious voice, rescues and protects her, soon journeying to discover Bacon's motives and put a stop to his evil intents. Shadow Hearts, developed by Sacnoth and released in North America in 2001, is the sequel to the company's first title, Koudelka, and is much-improved over its predecessor. 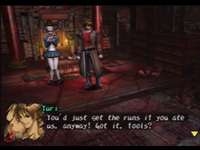 Rather than featuring grid-based combat like its predecessor, Shadow Hearts instead features randomly-encountered, turn-based battles emphasizing use of the Judgment Ring, which accompanies just about every battle command and features a number of hit areas where the player must press the X button once the ring's arrow touches them. Missing one of these areas will either cancel the command or, in the case of normal attacks, which feature three hit areas, shorten the number of hits if the player has timed his or her button presses right in at least the first hit area. Most Judgment Rings, in addition to normal Hit Areas, also feature narrow Strike Areas that increase an attack, spell, or item's potency. In addition to HP and MP is SP, which depletes one point at a time whenever a character takes his or her turn. If a character's SP reaches zero, he or she goes berserk and randomly executes commands against either the enemy or your own party. Items, however, can increase SP and bring a character out of berserk state. The main character, Yuri, must use SP to transform into one of his Fusion forms, which are of six elements; Yuri can gain new Fusions at the Graveyard after he acquires a certain number of points for each element. As players fight, moreover, Malice gradually accumulates in the Graveyard, and Yuri must go there to clear it out occasionally or risk encountering a powerful enemy in the real world. The battle system is well-paced enjoyable for the most part, with only a couple of minor shortcomings such as the lack of a turn order meter, and that the acupuncture system, where a player can increase a weapon's hit area widths and attack power, is a bit unnecessary since characters will constantly gain new weapons throughout the game. As far as difficulty goes, Shadow Hearts is generally easy, though some of the last few bosses can easily slaughter you. Nonetheless, combat is easily one of the game's highlights. Shadow Hearts' menu system is clean for the most part, and finding out how to advance the game is hardly an issue. There are, though, some issues with shopping, where the game eventually offers the player bonus discounts or increased selling prices with multiple Judgment Rings, with a higher discount/selling price for each Judgment Ring; if the player misses a hit area in one of them, an item is bought or sold at normal price. Though a decent idea, it can somewhat slow down players if they wish to save money. Changing party formation, moreover, requires players to talk to acupuncturists at towns, so working with all your characters in dungeons, in most instances, is out of the question. Ultimately, interaction isn't perfect, yet doesn't severely hamper the game. The Judgment Ring is only mildly inventive, reflecting upon the idea of timed attacks present in previous RPGs such as Legend of Dragoon and Super Mario RPG, although some features, such as the SP system, are certainly unique. The story, while not a reason to buy the game, does have its strong parts, such as a reasonably likable cast of characters, most who have at least some influence in the grand scheme of events and a little backstory, although the villains could've used some work, and the plot could've certainly revolved around more than just chasing after one of them. There are, though, some links to Koudelka, even if the mistranslation of one character's surname hurts one of said links. All in all, the story isn't exactly superb, although it still doesn't detract from the game. Even after two sequels, the first Shadow Hearts' soundtrack is still perhaps the best of the series, with some catchy ethnic pieces and dark themes that fit the milieu of the game. Battles, though, have a rather odd combination of English and Japanese voice clips, but this issue isn't serious enough to make your ears bleed, and in the end, Shadow Hearts is still a pretty decent-sounding game. 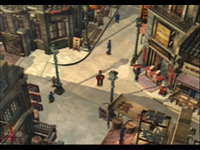 Visually, Shadow Hearts depends on a combination of pre-rendered scenery and 3-D character models outside of battle, both of which, for the most part, look pleasant, although maybe two dungeons use exactly the same stills for different rooms. The battle visuals, however, are in full 3-D, and move smoothly despite some bland texturing at times. A few cutscenes, moreover, rely on FMVs and still art to narrate the story, which are well-executed for the most part. Overall, Shadow Hearts' visual style is fairly effective and again doesn't detract from the game. Shadow Hearts isn't a terribly lengthy game, taking from about twenty-five to thirty-five hours to complete, with a replay mode allowing for additional playthroughs (and with two endings, the game is worth replaying at least once). In the end, Shadow Hearts was a fairly redeeming title for Sacnoth, with an enjoyable combat system and decent presentation among other things. It would, of course, receive two sequels, and since the series hasn't covered all of history, future installments certainly aren't out of the question.